Alsco has been a supplier of aluminum home-building products and siding trim products for almost 60 years. Aluminum siding, fascia boards, soffits, rainware, frieze trim and painted aluminum coil are among the many products Alsco offers. The upsides to aluminum siding: It is relatively inexpensive, durable and suitable for most climates. It is low-maintenance, doesn't rot and resists insect damage. It is also available in a variety of finishes. On the downside, aluminum siding can be easily dented, and self-installation can be difficult. 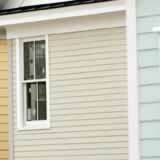 Siding installation is best left to professionals. Alsco is one of the leading manufacturers of aluminum siding, with a reputation for quality products and high standards of customer service. Alsco takes full control of the manufacturing process in-house, which enables the company to maintain high standards of performance and value. Alsco might be the best option for siding you can trust. Aluminum or vinyl siding trim, which is best?